Three pupils and two teachers from The Kingsley School were honoured to attend Professor Stephen Hawking’s Memorial Service today at Westminster Abbey on Friday 15th June. 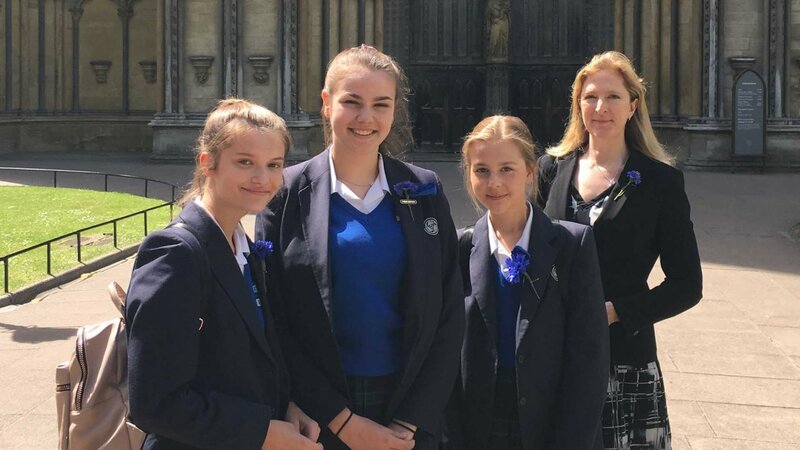 Erin Clarke, Gemma Hotchkiss and Emily Talbot, all in Year 10, accompanied Kingsley’s Head of Physics, Mrs Alex Hawthorn, and Head of Maths, Mr Thomas Spillane, to the service. The school were offered the opportunity to attend out of the 25,000 applications for tickets made by the public. The girls joined the likes of Professor Brian Cox and David Walliams in the Abbey, and were interviewed for a Japanese TV channel about Professor Hawking and their thoughts of the day. Tributes and readings were made by family and friends, including Major Tim Peake, Professor Kip Thorne and Benedict Cumberbatch, with a message of hope, perseverance and a life well lived. Professor Hawking’s ashes were interred between Sir Isaac Newton and Charles Darwin, taking his place among Britain’s greatest scientists. All guests were given a copy of ‘The Stephen Hawking Tribute’ by Vangelis; the music featuring Stephen Hawking’s voice that was beamed towards the closest known black hole by the European Space Agency. The Kingsley School is currently undergoing major development work in all of its science laboratories, including the transformation of the physics lab to a new, state of the art ‘Space Station’, the first of its kind in the UK. The inspiration and work of Professor Stephen Hawking will be a prominent feature of this space, continuing to inspire students for many years to come.